HONOLULU – The Hawaii Department of Agriculture (HDOA) is asking those who purchased plants at the Punahou Carnival to check their plants for little fire ants (LFA) after the stinging ants were found on a staghorn fern that was sold at the carnival on Feb. 2nd. A resident in Kaimuki reported that she and her infant were stung while they were in bed last week. 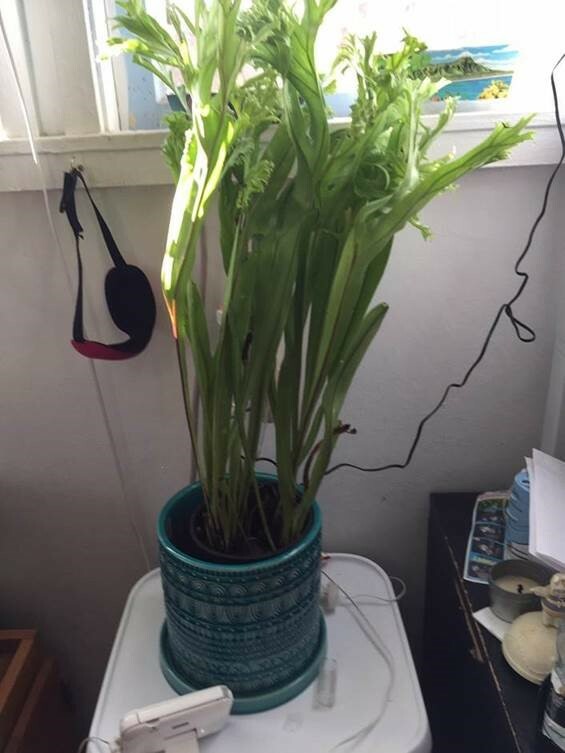 A staghorn fern purchased at the Punahou Carnival had been placed on a nightstand next to the bed and the resident noticed tiny ants crawling on the nightstand. She collected samples and brought them to HDOA on Feb. 25th. The ants were confirmed as LFA by state entomologists. The staghorn plant was bagged and frozen to destroy any ants. Other plants that the resident purchased at the carnival were also checked and no LFA were detected. The nightstand area was the only place in the home where LFA were found. Officials at Punahou School and the carnival coordinators were contacted and are fully cooperating with HDOA. Yesterday afternoon, staff the Hawaii Ant Lab (HAL) conducted a survey for LFA in the areas where the plants were staged and sold and no LFA were detected. HDOA is also working with carnival coordinators to try to determine where the plant in question came from and if other types of plants were also donated. The resident reported that there was at least one other staghorn fern that was next to the one she purchased. HDOA would like to hear from the donor of those plants so that staff can survey that area for LFA infestation. HDOA staff is also conducting a survey at a location where remaining plants from the sale are being maintained. Those who have donated plants or have concerns about purchasing plants at the carnival may contact HDOA’s Plant Pest Control Branch at (808) 973-9538. Anyone moving plants or outdoor material, especially from Hawaii Island where LFA is widely established, should take extra measures to ensure that LFA are not hitchhiking. It is also a good practice to quarantine any new plants and test them for LFA before moving them into your home or garden. Originally from South America, LFA is considered among the world’s worst invasive species. LFA are tiny ants, measuring 1/16th inch long, and pale orange in color. 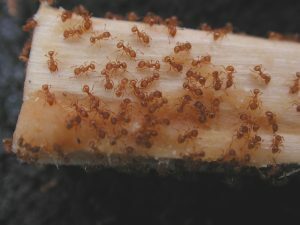 LFA move slowly, unlike the tropical fire ant, which is established in Hawaii, can move quickly, and is much larger with a larger head in proportion to its body. LFA can produce painful stings and large red welts and may cause blindness in pets. They can build up very large colonies on the ground, in trees and other vegetation, and inside buildings and homes and completely overrun a property.